Japanese Episode AG 090: "Minamo Shiti Touchaku! Porokku to Tsubame Gaeshi!" American Episode 362: "Pokéblock, Stock, and Berry"
Haruka-tachi have arrived in Minamo City! As Haruka visits a Berry marketplace, she comes across a Buupig trainer named Kanata. Kanata reveals that she is a Coordinator participating in the Minamo City Pokemon Contest and invites Haruka to her house, where her mother also runs a Berry store. As Kanata shows Haruka how to use a Berry Blender to make Polocks, Satoshi goes off on his own to train his Ohsubame to use Hatching Swallow ("Aerial Ace") for its upcoming gym battle. After a few failed attempts, Satoshi is approached by a man named Jinbei. Jinbei takes our hero to a training ground specifically developed to teach a pokemon Hatching Swallow, and Ohsubame seems to be doing well with the new training. As time passes, Haruka and Kanata are attacked by the Rocket-Dan, but Haruka's Wakashamo is able to send them blasting off. At that moment, Haruka decides to use Wakashamo for the Contest and continues to train it until the big day arrives. Kanata, Musashi (using Kojirou's Chiriin), and Satoshi-tachi watch as Haruka takes the stage for the Appeals round. However, one of her pokemon's fire attacks gets out of control and threatens to engulf Haruka in a bath of fire! How will Haruka get out of this pinch? To be continued! Haruka's newest Contest is here, and with it we get a new Coordinator, Kanata. While Kanata as a character doesn't stand out too much, I do like the fact that she introduced the whole concept of Berry Blending into the anime. It pretty much gets Haruka started on the path to developing her own Polocks which, as we'll see in the next season, will really come in handy. The subplot with Satoshi training Ohsubame was nice as well, even if he is being a jerk in the process. I mean, Haruka sits through all your Gym Battles, so why can't you just sit and watch Haruka during her Contests? Takeshi and Masato watch all of them, so why do you always have to run off and train your pokemon during her big moments? I know I've made this very same complaint before, but it's still aggravating that Satoshi can't be a little more supportive of his friends. The dubbed version has a few weird translation oddities that surprised me, but other than that it's pretty standard. The Japanese version has a lot of anime versions of video game music that's rarely heard, even in the Japanese version, but of course we don't hear any of it in 4Kids' version. Two seconds are trimmed from the opening shot of the episode. Two more seconds are trimmed from the episode's title screen. Which now makes me want to go back and check all the other Advanced Challenge episodes to see if I've somehow missed title screen cuts from every episode in the season. Finally, in the shot immediately following the above cut, there's a second trimmed. 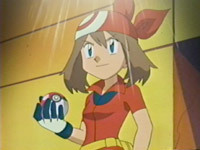 Jessie: "Are you thinking what I'm thinking about Grumpig?" James: "If it's reminding you of my ex-fiancé, then yes." While it's nice that 4Kids remembered a character from way back in the Kanto days, the Japanese writers didn't; originally, Kojirou was marveling at how great Buupig's Psychic attack was. So like the line about Professor Ivy in "Destiny Deoxys," this allusion to the past is dub-only. Kelly's Mom: "I'm sure you've probably used a Berry Blender before, right May?" May: "Oh yeah! Lots of times!" In the Japanese version, Haruka says the exact opposite; that she hasn't ever used a Berry Blender before. Wow, we don't get any time cuts until the very end of the episode, where three seconds are trimmed from the TO BE CONTINUED... screen.